Well, apparently my brain is not performing as desired. (This is news?) I keep setting off alarms while awake and feeling more or less fine, but have only set off one alarm, that I remember, while asleep. I slept fitfully last night, though I did manage to make it to REM sleep. I had a dream in which the founder of the company that laid me off showed up. I have no earthly idea why, but he was there. I slept a good portion of the day today. For some reason I was really tired. I know it’s noisy here and that I can’t sleep more than 4 hours at a shot, but I was just really groggy all this morning. One of the residents came in to see me and I know I talked to him but I don’t remember what I said. I think he’s coming back later, so I should find out. Since you all have been so fantastic about sending me stuff, I thought I’d post it here. 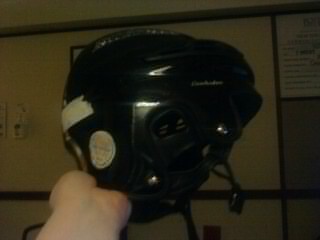 A photo of my helmet. The safety helmet of DOOM. last night when my new night nurse came on duty. She was highly amused by the fact that I took a photo of it and actually seemed to warm to me quite a bit. I was listening to MP4s sent to me by a friend from choir when she came in and when she found out I was singing in them she was very impressed and asked me all about them. I like her, I hope she comes back tonight. Yesterday’s promised passel of med students never appeared, unless they snuck in while I was napping. I managed to get through the day yesterday without 1 full neuro exam, which is both frightening and amazing. I haven’t had one yet today either. If you have a moment, send Geoff an email. He’s home with a vicious head cold and he’s losing his voice. He can’t come visit me till his fever goes down and he can’t really communicate via phone, so we’re texting and emailing. I think that’s it for now. If something interesting happens, other than the constant beeping and groaning of machines, I’ll post it here. This could just be me, but IMO the nonappearance of a passel of medical students (a muddle of them, perhaps?) is a GOOD thing. I LIKE that! A Muddle of Medical Students. Ha! Considering I just saw one walking by and discussing his presentation with his preceptor, I think that term is entirely apropos. I am hanging in here. My new day nurse and night nurse apparently find me amusing. This is a good thing. I wonder what they’d think if they knew I was blogging them? I recognize this is perhaps a somewhat irrational fear, but the whole “teaching hospital” thing scares the bejeezus out of me. I trust they are treating you well! Liveblogging hospital stays…gotta love it. Continue to hang in there. Today’s “good day for a nap and a seizure” comment made me snrk. Yeah, I understand that. I’ve had the same thought myself. The thing is that this is the teaching hospital for BU, MGH is the teaching hospital for Harvard. I think pretty much every hospital around here is a teaching hospital. You can tell them that you don’t want medical students near you and they’ll honor that request. All the students get to do is interview you, take a history, and then present to their prefector. If anybody without credentials, the proper outfit, and the right initials after their name came after me with something sharp I’d hog tie them with my super data cable and call for help with my magic reg seizure alert button.